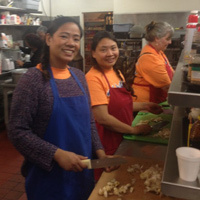 For Webster Works Worldwide, Webster University's annual service day at campuses around the world, nine students, faculty and staff from the Irvine, California, campus location prepared and served location at Someone Cares Soup Kitchen. Founded in 1986, the organization serves approximately 300 individuals a hot lunch each day. They also serve breakfast on the weekends and provide after school tutoring services for local school children.